The Urbana University women’s basketball team snapped its losing streak with Saturday’s 82-72 triumph over West Virginia State inside the Grimes Center. UU had lost 11 straight contests entering the matchup, and improved to 2-16 (2-12 MEC). WVSU dropped to 4-16 (3-11 MEC). UU’s Sylvia Hudson led four players in double figures with 23 points in 22 minutes, while posting her eighth double-double by grabbing 11 boards. In addition, Nikki Current recorded a career-high 21 points on 7-of-11 shooting (3-5 3FG) while fellow freshmen Kami McEldowney (11) and Bailey Draughn (10) also notched double digits. Megan Beachy dished out a team-high five assists and Erin Morrow grabbed five boards. UU tied its second-highest assist total this season with 20 on 25 made field goals. The Blue Knights also had 20 assists in the previous meeting between the two schools. Overall, UU shot at a 40 percent clip, shooting 25 percent from three-point range and 74 percent at the free throw line. The Blue Knights outscored the Yellow Jackets 23-9 on points off turnovers after forcing 24 takeaways. WVSU shot 38 percent overall and 32 percent from range.The Yellow Jackets struggled in the third quarter as the Blue Knights limited the visitors to only two made field goals. The rebounding edge was even at 42-42 in a physical contest that featured over 50 combined fouls. UU grabbed an early 6-2 lead, but WVSU countered quickly and led for the majority of the opening two quarters. The Yellow Jackets went ahead 19-15 after one frame and their lead swelled to 12 after starting the second period 6 of 7 from the floor. Then, a UU run sliced the deficit to five just before halftime on a McEldowney free throw. However, WVSU remained out in front, 40-33, at the break. 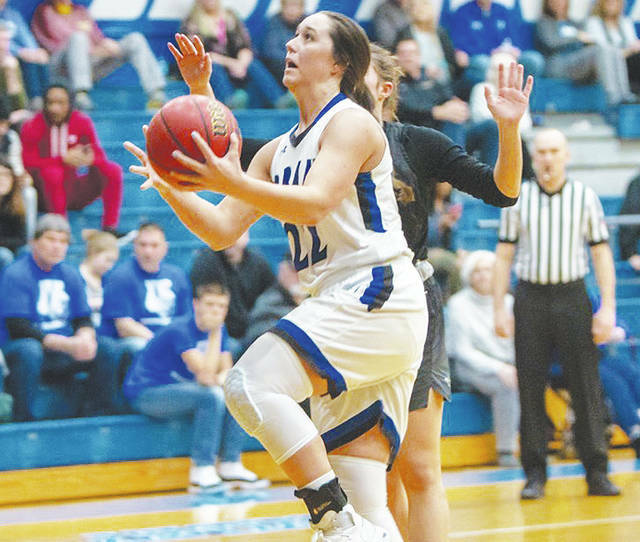 The Blue Knights came out hot in the third quarter and outscored the Yellow Jackets, 24-11. Morrow’s free throw capped a 14-5 run and gave UU its first lead since the first quarter, 49-48. Draughn also came up clutch with a pair of three-pointers during the run, and then two more treys from Current and Beachy lifted UU ahead 57-51 moving to the fourth. WVSU trimmed the deficit to three points with five minutes left, but the Blue Knights maintained their advantage. Hudson’s layup two minutes later put the Blue Knights up 10 and the hosts held on the rest of the way. UU resumes its three-game homestand by hosting Fairmont State on Thursday at 5:30 p.m.